Back in Toronto, there are two annual food events, one is the Summerlicous and one is the Winterlicious. For 2 entire weeks during a specific period, food lovers in the city can have the opportunity to satisfy their cravings for special tasting menus at some of the favorite restaurants in town at a much lower price than usual. The New York restaurant week offers similar "food festival" as well. Now Hong Kong is having its first week-long Springalicious food festival starting 27 April - 3 May. 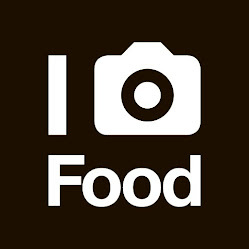 You can check out the Restaurant List and Menu <here>, do check often because the list is growing. When I was in Toronto quite a number of years ago, I attended a few featured Summerlicous / Winterlicious high-end restaurants which offer three-course prix fixe menus valued almost 50% discount compared with the usual menus. When the event first started, it was an immediate success but as the festivals carried onto their 2nd / 3rd year, things started to change in my opinion. A common issue experienced by many diners (including myself) was how the food quality and proportion seemed to be watered down along with the special price. When I first heard of this Springalicious event in Hong Kong, I admit I had the same concern and I clearly expressed that to the organizer during a tasting session which I was invited to. I have to say my concern is less relevant at this point because I realized I cannot quite compare this with what is being offered in Toronto for a number of reasons: (1) Springalicious covers more than just Western cuisines but a wider selection such as Japanese, Thai and Chinese; (2) the price discount is not extremely huge in comparison (~ 25% - 30% off) which sort of translates to more standard proportions and more of a reason to maintain food consistency for the participating restaurants; and (3) more than just for marketing purposes, this festival can let some chefs experiment with their creativity with special menus dedicated for it. Of course the above is yet to be seen or proven, but I think it has potential to be something interesting for many years to come in the Hong Kong food scene. 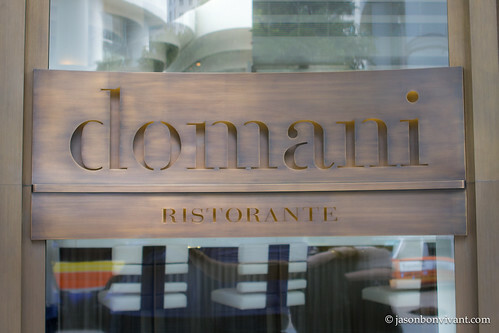 As mentioned, I was invited by Springalicious for a tasting at one of the featured restaurants, Domani Ristorante at the Pacific Place Hong Kong. Since it was a organized tasting, I will not go into great details on this entry so please treat this as a ... preview of what is being offered by Domani Ristorante for Springalicious. All I can say is that I had a great time and based on what I was offered (portions and quality wise), it is worth a try. In any case, you are getting an average of 25-30% discount, so make your pick on the restaurant(s) you long to try and give it a go (if on the list of course). Note: the menu is a dinner menu, not for lunch. Thanks to the lunch time tasting session, I have the natural sunlights for the pictures! 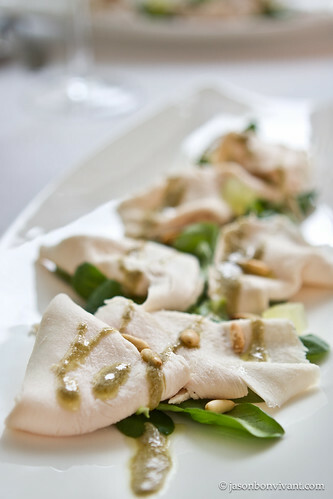 Slowly Poached Guinea Fowl Breast, Green Apple, Pine Nuts and Lemon and Capers Dressing. A very refreshing dish to start with. Light yet flavorful with the zesty lemon and capers dressing. 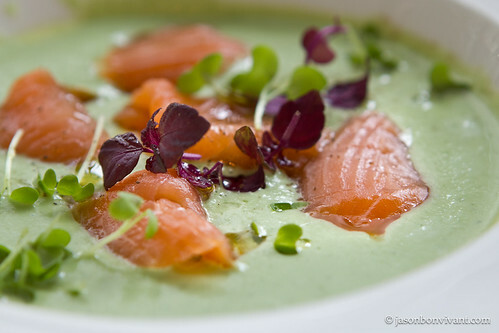 Cold Cucumber and Yogurt Soup, Smoked Salmon and Sprouts. A continuation or extension of the refreshing flavors. While appetizing, the yogurt flavor was quite .... exciting? punchy? or simply quite strong? Then again, some may like how it would give you a certain kick to it from the first sip. 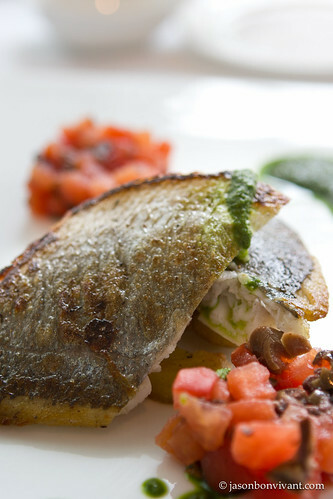 Pan Fried Sea Bream, Dry Tomato Salad, Potato, Basil Sauce. A very safe item to place on the menu. Nothing to complain on this one. So far all the items really brought out the joy of Spring with the rather zesty and citrus flavors. The same applied to the dessert. 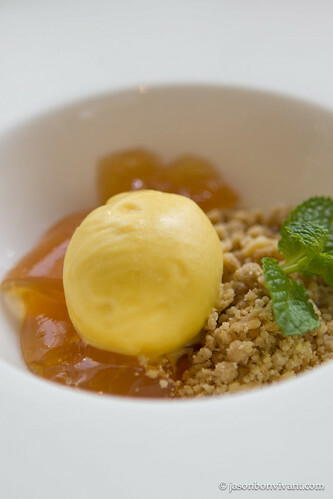 Mango Sherbet, Lemon Tea Jelly and Spiced Crumble. It cannot get more Spring than this! Note: I forgot why it was called spiced crumble because they were not that spiced (or at all for that matter) but yet very smooth and chilling way to end the menu. Slowly Poached Guinea Fowl Breast, Green Apple, Pine Nuts and Lemon and Capers Dressing - well balanced flavors in combination with the right amount of meat vs greens to start the meal with. 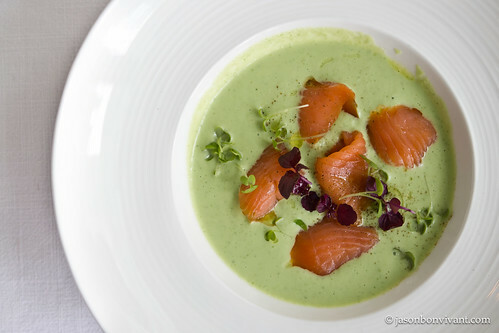 Cold Cucumber and Yogurt Soup, Smoked Salmon and Sprouts: while refreshing, the flavor can be quite strong for some diners. Give it a try on a hot and humid night. Avg Spending: The menu above is priced at HKD580 + 10%, a special menu for Springalicious.